A few weeks ago, my son was attending a camp at a local kid’s gym during spring break from school. I dropped him off and then stopped at the front desk to ask about the snack, to confirm it was vegan. In the past, snacks consisted of pretzels and fruit, so it was kind of an afterthought. I never even heard of dirt cake but apparently it is a concoction of crushed up Oreos, chocolate or vanilla pudding, whipped cream, and gummy worms or some combination thereof. After the fact I did some research and it seems to be a vehicle for eating Oreos. Anyway, at camp that day they were only going to be using the cookies and chocolate pudding. I did not have enough time to get home and make my chocolate pudding, even though it is quick and I needed an alternative. 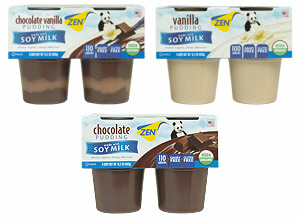 I ran to the health food store and found Zen Chocolate Pudding in a package with four little containers. It’s vegan and it says so right on the container. Phew. Ran back to the camp. Anything for my little vegan boy! Now, I have a thing for pudding. Chocolate, vanilla, chocolate and vanilla at the same time. I have experimented with several techniques to make a pudding reminiscent of my mother’s My-T-Fine puddings we had as kids but I have not yet perfected a recipe and it is kind of too much work at this point. So I found myself indulging in the Zen puddings. The three little containers that I brought home? I ate all of them. Myself. Not in one day, but one each day. Please! I do have some control. I loved them! I have since tried the vanilla and chocolate and vanilla swirl. Same! Pudding = love! I am not usually one to eat processed foods, but Zen is organic and it is a treat so I am on board! I corresponded with the company to tell them how much I appreciated the vegan organic pudding and it turns out they make soy milk too! My boys love soy milk. So we did a blind taste test. 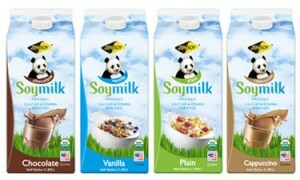 Our usual brand of unsweetened soy milk vs. ZenSoy Plain Soy Milk. My husband could tell right away which was which. He has been drinking the other brand forever. However, he did give the ZenSoy milk a thumbs up! My son absolutely loved it and said it was better than the other brand. I am writing about this today because after reading Pandora’s Lunchbox and learning about how added vitamins may not be vegan, I became very concerned about the few items I still buy in packages. One thing that I love about Zen is that they state clearly on the container that the milk is vegan. Our old brand does not state it as such on the package. I did check their website, where it does say the milk is vegan, but I prefer to support a company that specifically states it on the label. We have officially converted! Go ZenSoy!